Audiences’ ability to precisely target users is the reason why messages sent with Localytics outperform when it comes to open rates and app launches. It lets you automatically segment users and send them targeted in-app, inbox, and push notifications. 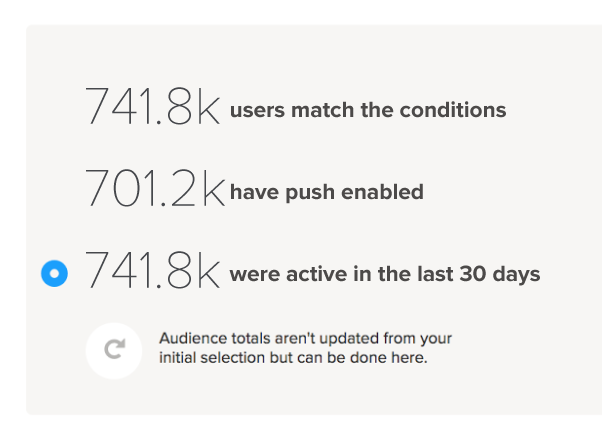 Audiences allows you to group users in a way that makes sense for your messaging goals. They are built using a combination of demographic and detailed in-app behavior. Start your campaigns by focusing on the right Audience to get the best results. Use detailed in-app behavior to understand your customers’ preferences. For example, build one Audience of mobile app users who repeatedly watch comedies and another Audience of users who repeatedly watch dramas. Identify your most engaged loyal users and give them some special recognition with a discount offer or access to exclusive content. Welcome new users with a series of onboarding messages that highlight features of your app and help customers get started on the right foot. Audiences in Localytics help you increase your conversion rates by giving you granular behavior and demographic targeting data to segment your users. With the right group of users in mind your messaging campaigns results improve by up to 2x. As mobile users interact with your app and you learn more about them, they will dynamically be added or removed from Audiences. This means they’ll become eligible to receive messages you’ve tailored for users just like them and prevented from receiving campaigns they don’t need. Your user data from other systems can be imported to create even more precise Audiences. Our Audience API allows you to import and export entire Audiences, making it easy to incorporate Localytics into your other targeted marketing efforts.